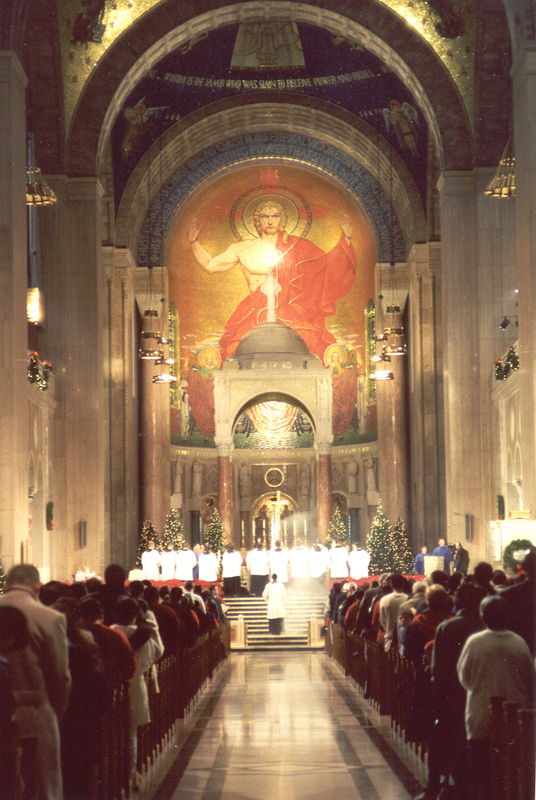 When I was a seminarian, my spiritual director at the time was a priest assigned to the Basilica of the National Shrine of the Immaculate Conception in Washington, D.C. Each morning, if he was not assigned a public Mass, he would go up to the Upper Church and say a private Mass at one of the side altars. As he would exit the Upper Church to make his way down to his offices in the Lower Church, he would almost always be stopped by pilgrims and other visitors to the Shrine who would marvel at the great mosaic in the apse of the basilica, the area at the far end of the church, behind the high altar. There is depicted our Lord of the Last Judgment. The Lord Jesus looks angry and He wears a red sash and fire comes out from behind Him - it is clear that the business of the last Judgment is about to begin. It is at once both an imposing and striking image to behold. My spiritual director told me that nearly 2 in 5 visitors to the shrine who would see this image, had no idea that it was a depiction of the Lord Jesus. They would ask him, "Father, who is that?" My spiritual director would answer half seriously, half jesting, "That's the Son of God and when He returns in glory, He's not going to be happy." Today's Solemnity of Christ the King reminds us that the Lord Jesus is the King of the entire universe. Everything is under his dominion and power. It's a title that hasn't been emphasized enough in the last 40 years or so. So often, we have been told to think of Jesus as our friend, or brother, our buddy or even our co-pilot. It's a theology that tries to make Jesus more accessible and yet renders Him our equal and we know that's not true. At times, our Lord is depicted in more modern art as being soft, effeminate, and a bit clueless. When I was growing up, we were not told to think of Jesus as judge - we often were tasked in CCD class with coloring Jesus in our coloring book theology texts with all kinds of happy colors. That is not at all the Lord Jesus whom we celebrate today. Today, we honor and adore Him as king, in particular. There's a tone of severity here. Judgment is not pleasant, touch-feely material after all and that's perhaps why the notion of Christ the King is an image of our Lord that we are all too uncomfortable with. Yet, we acknowledge this reality weekly, when we say in the Creed each Sunday, "He will come again to judge the living and the dead, and his kingdom will have no end." Our first readings today is from the prophet Daniel. It's a very apocalyptic reading. In fact, most readings for this Solemnity are of this nature - readings about the end times. Today's Gospel, however, is a bit of a diversion from that theme of fire and brimstone. In our Gospel from St. John, we get a glimpse of what our Lord's kingdom is all about. As our Lord stands on trial before Pilate, He reveals that His kingdom is not of this world. In other words, Jesus' kingdom is not like temporal kingdoms, like the Roman Empire or the Ming Dynasty. Our Lord reveals that the Kingdom of God is not about political power. Rather, it is about the power of conversion that is taking place in the hearts of men - men who hear and listen to the truth. No longer is the truth just some abstract concept - now, THE TRUTH is a person, our Lord. Blessed Mother Theresa used to say that the greatest miracles occurring in the world were not miraculous physical healings. Instead, the greatest miracles were the conversion of hearts. In other words, the Kingdom of God begins with individuals like you and me submitting ourselves to our Lord as king in obedience. Note well that obedience is not the same thing as compliance. Compliance is the mere following of an order. One may comply with an order and yet not agree with the order. Obedience is something more profound - it means not only complying. It also means having the mind and the heart of the lawgiver. Obeying God means obeying the Church, for it is through His bride that our Lord makes His will known. Allowing Him to reign over ALL aspects of our lives is no easy task, but it is what He asks of us. It means that whatever God asks of us must be our first consideration and priority. It means that there is nothing about our lives that our Lord doesn't want dominion over. And yet, how does God rule over us? He never forces or coerces us - we maintain our free will to accept or reject His grace. God does not impose His will. Rather, he proposes His will and allows us the freedom to choose our path. In affording us this high dignity, He asks us to see His law as a freedom for excellence - the capacity to do what we ought. His law is not a constraint or a burden - it is a law for freedom - His yoke is easy and His burden is light, if only we give ourselves over to Him. 1. Pray a family rosary nightly and meditate upon the infancy narratives of the Gospel of St. Luke. 2. Invite a fallen away Catholic to Mass - let them know when the Confession times are as well. 3. Pick a daily mortification and make a good Confession - a pure heart and clear conscience are the best gifts we can make to the Christ child at Bethlehem. As we continue our celebration of this Solemnity of Christ the King, let us echo the words of St. John in our 2nd reading from Revelation and make them our own, Jesus Christ is the faithful witness, the firstborn of the dead and ruler of the kings of the earth. To Him who loves us and has freed us from our sins by His blood, who has made us into a kingdom, priests for His God and Father, to Him be glory and power forever and ever. Amen!